Growing basil, how to pick basil leaves, how to use basil. It’s all right here, folks. Years ago an old farmer told my young boys that when they started dating, a big bunch of sweet basil in the car would win a girl’s heart. Now, I don’t know about that, but growing and harvesting basil is one of my favorite summer garden activities. The fragrance definitely makes me happy! 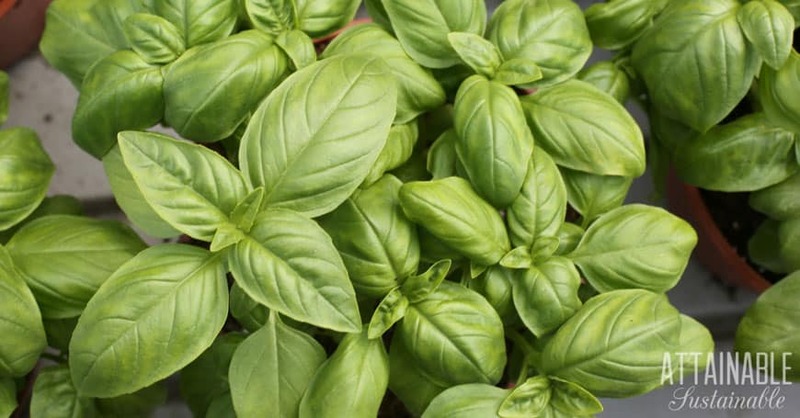 Sweet basil is a culinary herb used frequently in Italian cooking and is the base for our favorite pesto. It’s not the only type of basil, though. There are dozens of different cultivars to choose from. 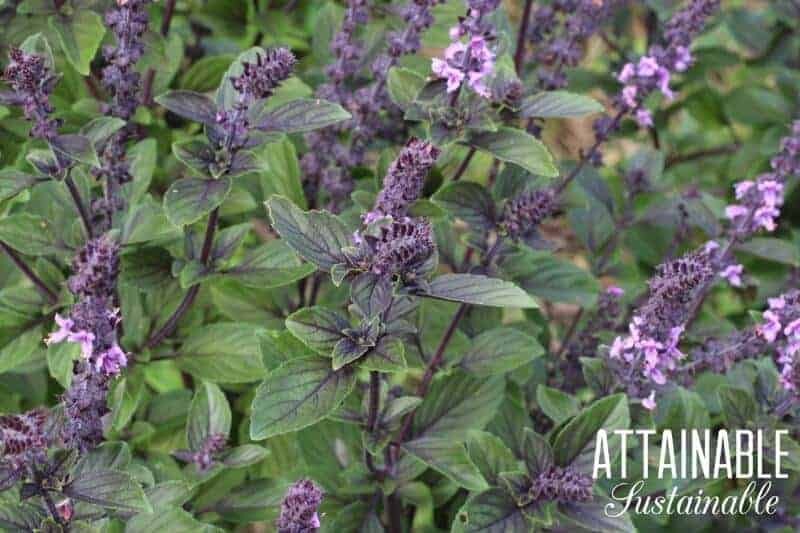 Some are purple, some are ruffled, and some, like Thai basil, are favored for specific cuisines. Pictured above is my African blue basil. Basil is one of those wonderful garden plants that just keeps on giving. Unlike radishes and beets that are done once you harvest them, basil plants provide their pungent goodness for months if you treat them right. Harvesting basil so that it produces all summer long is easy. Basil likes warm weather, tolerates heat, and prefers well-drained soil. Direct sow seeds after frost, once the ground has warmed. Trust me; trying to get a jump on it by planting too soon will just waste basil seeds. If you opt to start basil seedlings for transplanting, a heat mat to increase the soil temperature will greatly improve your odds. 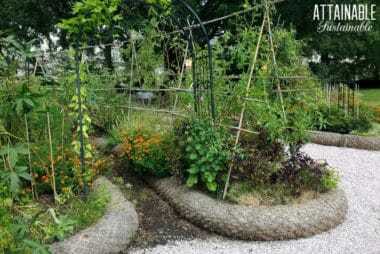 Water deeply and regularly, and side dress with compost or well aged manure. There are numerous varieties of basil. Italian sweet basil — Genovese — is the cream of the crop, and the favored basil for making pesto. There are many named varieties of basil from different origins. You can see more here. These rules for harvesting basil apply for growing basil indoors, too, though an indoor basil plant might not need to be trimmed as frequently since it’s unlikely that it will grow as vigorously inside as it would in a hot garden bed. You can harvest basil from a healthy, mature plant just about any time. Snip off the basil leaves you want to use in recipes as you need them. When flower heads start to form on a mature plant, it’s time to really prune your basil. If the plant is allowed to flower, it will put energy into trying to regenerate itself by making seeds. You want to prevent that, so that you’ll have a basil harvest all summer long. If you see flower heads beginning to form on a young plant, pinch them off. Pinching the flower heads off prevents the plant from putting energy into producing seeds, allowing it to grow more foliage. Harvesting basil needs to be done regularly. 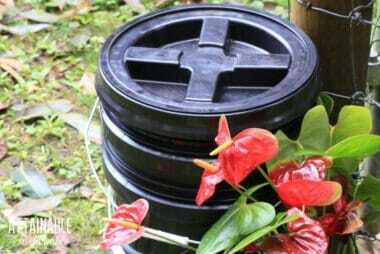 Regular harvesting inhibits flower production on growing basil plants so the plant will continue to produce leaves and provide an abundant basil harvest. Simply use scissors to prune off the upper leaf clusters. Make your cut close to the set of leaves below. No scissors? It’s perfectly okay just to pinch the basil from the plant with your fingers. Often, you’ll need to cut more than one leaf cluster, and that’s okay. Just be sure to snip right above the set of leaves you’re planning to leave on the plant. New growth will sprout from that point, allowing you to harvest throughout the season. 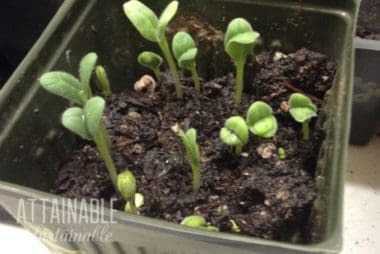 You’ll want to make sure to leave some green growth so that the plant can do its photosynthesis thing, but the plant will be noticeably smaller. Prune basil every week or two, to keep your plant healthy. The cut stems and leaves are your basil harvest. I have almost a dozen plants and these provide enough basil every time I harvest to make two batches of pesto – one to eat fresh, one for the freezer. Besides girls and pesto and Italian food, here’s another reason to grow basil: Bees. While we humans love growing basil for its pungent leaves, the bees love it for the flowers. Trouble is, in order to maintain a continuous harvest of sweet basil leaves growing all summer long, the flower heads need to be removed. Allowed to flower, the plants will go to seed and stop producing those fresh lovely leaves. Luckily, there’s an easy solution. Plant several extra basil plants. Once you’ve harvested the first batch of leaves, allow a few plants to go into flowering mode. I’ve had good success with saving and replanting basil seeds for a sustainable basil harvest, year to year. If you want to gather seeds, choose one basil plant as your seed producer. Let it flower and watch as those flower heads turn to seeds. Allow the seed to brown on the plant. If wet weather threatens, you’ll want to clip them and bring them inside to dry. Pull the dry seed pods from the stem. Roll dry pods around in the palm of your hand to remove the small black seeds. Seal fully dried basil seeds in a paper envelope and store in a cool, dry place. Saving heirloom seeds from year to year is easy to do and will save you the expense of buying seeds. Growing basil in my garden means I use fresh basil leaves all summer long snipped into in salads, wraps, sandwiches, and for flavoring soups and pasta. By far, though, our favorite way to use it is to make pesto. We spread pesto as a base for wraps, on egg salad sandwiches, and of course, use it in pasta dishes. I freeze pesto in small glass jars for use all through the winter months. I love adding spoonfuls of it to soup! My pesto recipe is here. Here’s how to dry basil for flavor all year round. This post about growing basil and harvesting basil was originally published in July, 2011; last updated November 2018. I’m jealous. My basil plants are barely half an inch tall. I also make pesto for the freezer–it keeps perfectly all year, until the next year’s basil is ready. I also make cilantro pesto, just substituting cilantro leaves for basil leaves. Both versions are delicious!!! My husband would love cilantro pesto. Love cilantro pesto. Don’t forget garlic scape pesto, too. I have the hardest time growing basil though I see it growing like a weed elsewhere. Too high and wet? My daughter grows amazing basil plants in a pot and usually it gets ignored because she has a 2 and 3 year old. Oh and the 2 year old is rough on that plant and it is just thriving away and huge! I have mine in the ground and most of the time, if it doesn’t get rain it won’t get water unless I happen to think about it and it is huge. For me I think they are like geraniums they like to be ignored, left alone and a minimum of water. Can’t be ignored forever of course but many herbs will grow in poor soil and in the hottest sun with a minimum of water. They do seem to do well in hot, harsh conditions! My basil is pretty puny still, but I am taking several leaf clusters each night to put in our fresh salads. I should really make pesto. I love love love basil, but mostly just because I love the lovely aroma. Wow, your basil looks so healthy and fresh; mine’s a tad wilted in the heat! My favorite thing is a caprese salad with tomatoes and fresh mozzarella — as soon as my tomatoes fruit I’ll be eating it all summer long! Heat is not something we’ve had to deal with yet this summer! I’m with Melanie, above, love basil in a Caprese salad and we’re big fans of putting pesto on everything over here: pasta, potatoes, bread. Just had some Thai basil fried in a rice bowl dish that was divine. My son came in the other day with pesto, kalamata olives, and feta on toast. Good taste, that boy. Basil has to be my favorite herb. I love all of the different varieties too–Thai, purple. My basil seems to go from barely sprouted to bolting. SO FRUSTRATING. I’m trying a different varietal this year-lettuce leaf basil. I’m hoping I’ll have better luck with it. It’s supposed to be great for pesto. I made my first batch of pesto using these tips on how to harvest basil. Great tips, less than a week later my pesto is as bountiful as before I made the cut! I put a twist on the original pesto recipe. Thats absolutely one way to go about it! I tend to find that successive planting works better for me – Id much rather have a little bit all the time than huge dumps of basil that I then HAVE to make pesto out of. Ive got this great infographic on successive planting here: http://bit.ly/SSHdYv Happy Growing! I love to take a couple basil leaves, roll them and take my kitchen shears and cut thin strips and then put them in a salad or on a sandwich. It just takes it up a notch. I live in Utah. It’s hot and dry. Tried growing basil in the ground, in pots and in the house. It either goes to seed and/or the leaves get skinny and sparse. Does it like hot, sun, cool, shade? Where are you growing it? If I try again, I will follow your pruning suggestions. I find that it likes warm/hot summers but steady moisture. Most all of my basil these days come as volunteers from plants I’ve let go to seed. I’m growing in Hawaii, but it’s done really well for me in hot northern California summers, too. Hi! Im fairly new to gardening and i found your article helpful. Im just wondering why do you want to harvest your basil before it starts flowering? Or what happens if it flowers ? You use basil for its leaves. When it starts to flower, the plant puts less energy into making leaves. The bees like the flowers, though. i usually freeze most of mine since it lasts so long in the freezer — i’ve heard a year though it never lasts in my house. I just cut it right above any two leaves and you don’t take those. Enjoy! I mix basil, garlic, olive oil process and coarse shreds of parmsean at end. Put in ice cube trays, freeze and knock them out in baggie. I use a similar recipe, basil, garlic cloves, toasted pine nuts, grated parmigiano reggiano, pecorino Romano, & olive oil. I have basil growing in a glass jar on the window sill, just add water daily. I also like adding lots of it to salmon pasta salad. What happens if your basil flowers? I tend to pinch of the flower heads as they appear until I’m ready to collect seed. Basil is one of my favourites. I grow it every year by sprinkling seeds around the garden, near the tomato transplants. They do well and I harvest often to make “basil boats” (an appetizer). For winter use, I use scissors to cut leaves directly into ice-cube trays, top up with water, freeze, then double bag. So easy and delicious in spaghetti sauce, just like fresh-from-the-garden. Thanks for sharing the proper way to take cuttings. My basil is getting eaten by some bug! Flea beetles (leaves lacy looking damage) are destroying all my basil. I started dusting them with DE, but I just read its harmful to bees. so.. I have so much basil, that I cannot possible eat it all. how can I keep basil for winter months? I make pesto: https://www.attainable-sustainable.net/macadamia-nut-basil-pesto/ but you can also chop and freeze in olive oil. You didn’t mention how many times should we water the plant? Just as much as is necessary to keep it from completely drying out. How would you make pesto from chopped frozen basil ? I’ve never done that! I suppose I’d try to figure out how much frozen basil is equivalent to the require fresh basil and then combine with remaining ingredients. Something you may want to do this summer: go to the dollar store and buy those old fashioned ice cube trays. Snip basil and fill each cube area and gently pour filtered water to full. Freeze. Once solidly frozen pop the cubes into a zip lock, repeat……when it comes time for making a sauce or some-such that requires basil, throw a cube or three into it and voila- as though you had summer all year long. YUM! I just started growing basil and you have been very helpful. I grow basil in a pot on my patio. I love The smell and taste. I grow basil in my pots. The leaves seem to get wrinkly and I have trouble with powdery mildew. Something eats my basil leaves too. I’ve tried a natural insecticide that I made and a vinegar spray. Nothing works. I love basil, but have such a hard time with it. Basil likes HEAT. Vinegar can kill plants, though, so use caution with that. Thank you so much for the tips. This was the best explanation I’ve seen so far. My biggest question was about the bees, because I love seeing them in my garden. (Bees are rare these days) Great idea to just have another basil plant for the bees to enjoy. Thanks! This is my second year growing basil. I’d like to continue my plants’ growth to keep producing leaves as long as possible but still make the coming year’s pesto supply in one go. I’ve only made pesto with fresh leaves. If I prune all season to keep the plants producing, how do I store the fresh cut basil until I’m ready for processing? I can’t think of a way to keep them “fresh” to do that. You could try freezing the leaves, but I’ve not done it that way. This is an awesome post. I really plan to get my “herb growing” on deck next Spring. And my honey bees will like to too! Thanks Kris.